The recent cold snap providing Boxing Day’s significant snowfall an enduring life over the past few days reminds me of many winter snow days in Canada. Indeed, I think back wistfully to those times. That is in spite of the intensely cold temperatures one often has to cope with in that beautiful country. During my many visits I had the good fortune to ski, both downhill and cross-country, ice skate and snowshoe through incredible and out-of-this-world landscapes. I went on snowmobile trips, engaged with wildlife and generally lived the life. Hugely influential on me were trips to stay in a genuine 1930s Canadian log cabin by Wabamun Lake in Alberta. The cabin was an experience like no other as it had little in the way of home comforts or even basic utilities. Water was gained by walking on to the frozen lake and using an auger before dropping a bucket down into the icy water. There was wood to be chopped, fires to be maintained, coffee to hand-grind and so on. It felt grounding to be released from modern technology and to get back to life’s most basic things. 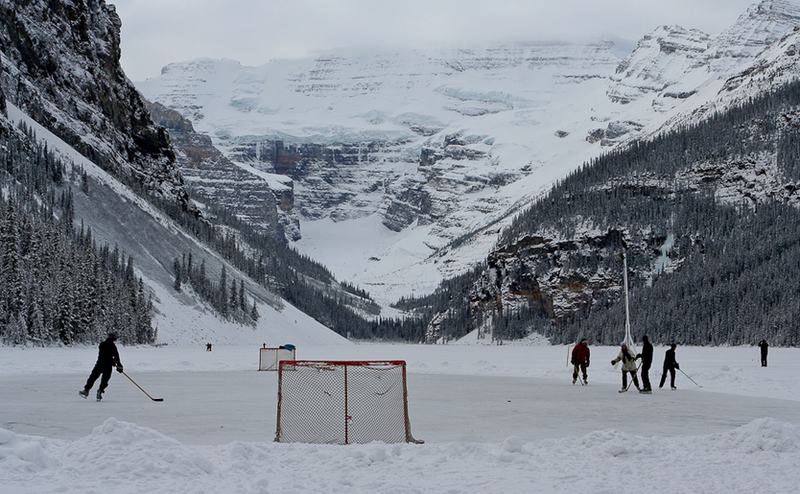 There is nothing quite like ice skating – and even better, playing hockey – outdoors. It is an absolutely exhilarating experience. I remember one Canadian saying to me that skating was ‘the nearest thing to flying’. I particularly knew what he meant the first time I managed to achieve my own ambition of playing for fun outdoors on Wabamun Lake, thirty miles from Edmonton, Alberta.. What a memorable day that was. A small party of us set out, wrapped up well, carrying sticks and pucks. Being born in the UK I’d been used to scrambling and scrabbling across the odd frozen pond as a kid – with some trepidation as the surface heaved, threatened and cracked. All such historic fears and reservations of collapsing ice were allayed however when a large truck drove past us on the ice! We cleared snow from the ice to form our rink with the obviously quickly-frozen ice as smooth and clear as glass. Even the fish underneath the ice could be seen swimming around, what a beautiful experience! I still remember well the ringing click-clack sound of sticks on puck and skating into the frigid air, the freshness – that feeling of just being alive. I was since fortunate enough to mess around with a stick and puck and skate on quite a few ponds and lakes in Canada, also in such hitherto unlikely areas as school playgrounds with the snow piled up in surrounding banks to make a rink. There really is no feeling like it. How I miss it. ‘Keep your stick on the ice’ eh. In loving memory of Margaret Weaver and to all my friends and family in Canada. Thanks Boots. And the best thing about that first day on Wabamum Lake was that Margaret came with us and was knocking a puck around with a hockey stick! Fond memories and never-to-be-forgotten days. Thank you for your comments and kind words, Debbie. I’m sure you would adapt well to the temperatures and of course it does have its great compensations. I know of Squamish – such an evocative sounding name – but have not visited the town. I’m guessing it’s a little more temperate like Vancouver. I hope you enjoyed your stay in BC, it’s such a beautiful province. Thanks again, Stuart.